Fife is almost peninsular in nature, pointing out into the North Sea, flanked to the North by the River Tay and to the South by the River Forth. It lies on the East coast, only 30 minutes by car, bus or train from Edinburgh - ideally situated for the exploration of the lowlands of Scotland. Bridges link much of Fife to the rest of Scotland. Both the Tay and Forth rivers are crossed by road and rail links - the most famous being the Forth Rail Bridge, providing a link to Edinburgh and the South. 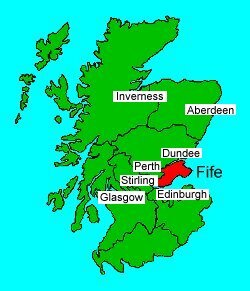 Fife has a long history of association with the Scottish monarchy, so much so that it's people fiercely defend it's right to be known as the 'Kingdom of Fife'. The region is home to Scotland's ancient capital, Dunfermline, and also the 'Home of Golf', St Andrews. Considering it is Scotland's smallest region, Fife provides the visitor with a huge range of places to visit and things to do. Whether history, travel, cuisine, sport or relaxation is your interest, Fife provides it all.